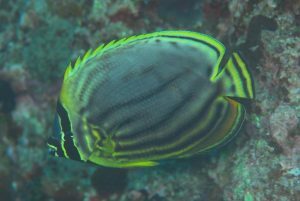 In October 2011, Robert Whitton and Richard Pyle found a small juvenile hybrid butterflyfish while conducting a rebreather dive in deep water in the Hawaiian Islands. It was the first hybrid Chaetodn tinkeri x C. miliaris reported since the early 1970’s. 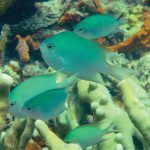 Interestingly, it was paired with a juvenile C.
Interspecies hybridization is an inherently fascinating biological phenomenon that can potentially offer us insight into the process of evolution and speciation on coral reefs. 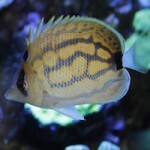 Aquarists have always admired such aberrant fishes for their unique aesthetic qualities, spending lavishly on these peculiar piscines, but we don’t often stop to ponder why it is that such genetic intermixing is possible in the first place. What ultimately limits the ability of two distinct species to form viable offspring? It’s beyond the scope of this humble blog post to attempt to answer that question with any real clarity, as even the brightest minds in evolutionary biology struggle with understanding the variables involved. But one obvious limitation can be seen by observing the general relatedness between the parent species in such hybridization events. Consider the many known mixes that occur with the Ocellaris Clownfish (Amphiprion ocellaris), which has been known to form crosses with its allopatric sister species, A. percula, and with virtually every other species group that occurs within its West Pacific Range: A. clarkii, A. frenatus, A.sandaracinos and even the Maroon Clownfish Premnas biaculeatus! 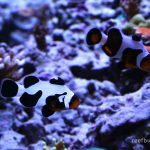 Hybrid clownfish pair. Maroon clown and snow onyx percula. This last mix is one I wish to highlight, as it helps to show how hybridization can elucidate evolutionary relationships that traditional morphology-based classifications have gotten incorrect. Despite the larger size and strongly spined operculum of the Maroon Clownfish, genetic studies have consistently shown that it is a close relative of the ocellaris/percula species group, and, in all likelihood, it will eventually be merged into that genus when the group is taxonomically revised next. On the other hand, there has never been a documented hybrid of a clownfish with another type of damselfish, despite the fact that clownfish are members of this diverse family. Is this a behavioral limitation? Is this a genetic limitation? The reef fish group with the greatest propensity for forming hybrids is the Family Chaetodontidae, particularly the highly diverse genus Chaetodon. As discussed in Hobbs et al 2013, more than half (44/87) of the recognized taxa are known to create hybrids with at least one other species, and it’s quite likely that this number is an underestimate. This is a startlingly high percentage and hints at an unusual permeability to the boundaries which normally serve to keep these species distinct. 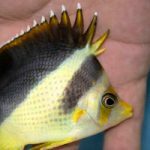 This is especially true for the Threadfin Butterflyfish Chaetodon auriga, which has been reported to hybridize with no less than seven (7!) other species, far more than most of its congeners. How do we explain this anomaly? 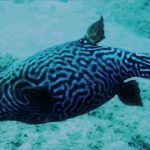 Why is this one fish able to interbreed across so many species boundaries, and how does this ultimately affect its ability to maintain itself as a distinct biological species? Another noteworthy observation is the general trend for such hybrids to become increasingly more abundant in the biogeographical locations that form so-called “suture zones”. Think of the many hybrids between Indian Ocean and Pacific Ocean sister species where their ranges overlap at Bali, Christmas Island and the Cocos-Keeling Islands. We see this elsewhere when neighboring ecoregions allow populations to intermix, such as at Socotra (where the Red Sea meets the Indian Ocean) or Palau and Guam (where the West Pacific, Japan and Micronesia collide) or the Northern Philippines and Ryukyu Islands (where the West Pacific and Japan meet). We also see quite a few of these Chaetodon crosses in the isolated islands of Hawaii and Johnston Atoll, which can be chalked up to the rarity of the parent species here, as well as the unusually thorough study and documentation in this region. But perhaps the most important insight to be made from hybrid Chaetodon is in regards to how conservative these interspecies mixes are in an evolutionary sense. The phylogenetic tree shown to the left includes every species in this lineage and incorporates findings from a pair of large genetic studies (Fessler & Westneat 2007 and Bellwood et al 2010), with some of the blanks filled in from data found on GenBank and previous morphological reviews. As I’ve written about previously, there are four major clades which are likely deserving of subgeneric rank, in sharp contrast to the overly complex and contradictory classifications which exist currently. And we find some interesting support for this in the relative lack of hybrids between these major clades. Only two interclade crosses have been reported; unfortunately, neither has been confirmed with any genetic inquiry and thus these remain considerably suspect. In Johnston Atoll, one underwater survey made brief mention of a suspected C. auriga X C. trifasciatus. This would be in keeping with the promiscuous trend already established for C. auriga, but C. trifasciatus is a strict corallivore with a very different behavioral ecology and is otherwise only known to cross with the very closely related C. lunulatus. The other cross was said to involve the even more distantly related C. guentheri and C. oxycephalus. It’s interesting to note how hybridization can vary in extent across different groups. We already saw how the different subgenera/species groups of clownfishes can interbreed, but the same seems untrue for butterflyfishes and the closely related angelfishes of the Family Pomacanthidae. While the classification has been slow to catch up with recent molecular research, it seems that the major evolutionary lineages of angelfishes stick to themselves. Of the many known hybrid “Centropyge”, the parentage appears to, without exception, involve close relatives. For instance, there are known crosses of the Flame Angelfish with Potter’s Angelfish, but never has there been an example of a Flame Angelfish interbreeding with the more distantly related Lemonpeel Angelfish or Multibar Angelfish or Colin’s Angelfish, though all of these are found together across the Central Pacific. The reason for this might have to do with some insurmountable barrier present in their DNA or some nuance of their behavioral ecology which limits interactions, but, whatever the cause, it helps to prove the utility of applying hybrid incompatibility towards our understanding of past evolution.